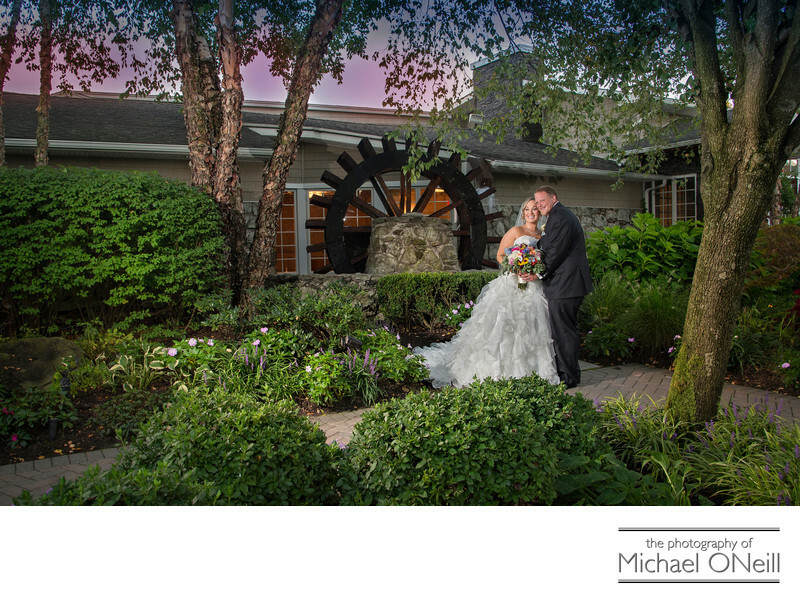 This colorful wedding photograph was captured at The Watermill in Smithtown, Long Island, New York. The Watermill was the site of some of my first wedding assignments 30 years ago and the venue has stood the test of time. The Watermill Inn was acquired a few years back by the same company that operates Westbury Manor, Chateau Briand and The Fox Hollow Inn. Like all of her sister catering establishments The Watermill features beautifully manicured lush gardens, this one housing the iconic operating watermill. This establishment has recently undergone yet another major interior renovation in elegant, contemporary fashion. This picture of the bride and groom was captured at dusk just before the couple went inside to host their spectacular cocktail and dinner reception. Located just 15 minutes from my East Northport, NY wedding photography studio and gallery I find myself on assignment at The Watermill many times throughout the year. I am familiar with all of the best places to take pictures on the property...indoors and out. If you are planning a Watermill wedding you owe it to yourself to visit with me and discuss your plans and wishes for the big day. I would love to be a part of your celebration and to be trusted with the privilege of capturing all the special moments for a lifetime of photographic memories.